Some people get a little anxious when it’s time to go in for their routine check-up. Others are downright petrified at even the thought of scheduling an appointment. In fact, it may have been years since you visited a dentist because you feel guilty about how bad your oral health is or maybe you have had a bad experience in the past. If this sounds at all like you, sedation dentistry can help. Dr. Coleman offers several sedation dentistry options to help fearful patients get back on track with regular dental care. These techniques vary and can be customized to meet the particular needs of each patient. Nitrous oxide works well for patients that get a little nervous at their appointment. This relaxant gas is simply breathed in through a mask and helps you to remain calm in the chair. The effects take place almost instantly and can be adjusted at any time during the appointment. When the treatment is over, the gas wears off within a couple minutes. It is completely safe to drive home and go about your day. This technique works well for mild anxiety. Oral sedation is for patients who would prefer a higher level of sedation. When Dr. Coleman determines you are a candidate, he will prescribe you some medication to take right before your appointment. The pill will make you feel sleepy and completely indifferent to what is going on. Even though you will be completely conscious, there is a good chance you won’t remember a thing. It differs from the general anesthesia that is administered in the hospital because your protective reflexes like breathing and coughing are still completely functional. But as an added safety precaution, there will be a fully trained staff member by your side the entire time to monitor your vital signs. When it’s all said and done, you will feel like no time has passed. It is important to plan for someone to drive you to and from your appointment because it will not be safe for you to drive home from the office. If you are absolutely terrified but know you need to be seen, Dr. Coleman also offers IV sedation services. 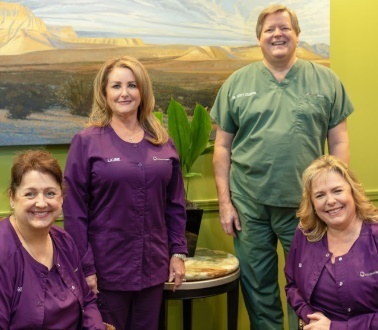 He regularly schedules appointments with Dr. Honeycutt, a board certified anesthesiologist, to deliver sedation intravenously right here at the office. This method will ensure you do not remember anything about the visit. You will likely not remember anything about the appointment. Your treatment will be pain-free! It feels like you were asleep and no time has gone by. Dr. Coleman can accomplish more in one appointment, so you may not require multiple visits. Sedation can be adjusted to meet your individual needs. It’s time to stop putting off that dreaded dental appointment! Call us at 713-783-2800 to find out if you are a candidate for sedation dentistry. Dr. Coleman is here to help!